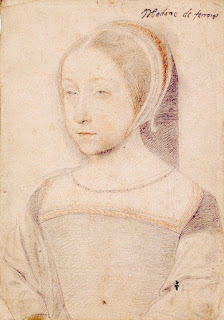 After her parents' deaths, Renée was raised at the court by Marguerite of Angoulême, the sister of Louis XII's successor, Francis I. Marguerite is a woman whom we have met before, noted both as a writer and for her sympathy for religious reform. When Renée was eighteen years old, in 1528, she was married to Ercole d'Este (the son of Lucrezia Borgia) in order to strengthen the alliance between France and Ferrara. Although the Ferrarese court was "one of the most glittering in Europe," Renée's "Italian career" as the duchess of Ferrara was a disaster, husband and wife mismatched in the extreme. Renée remained entirely French in her language and her sympathies. Her slowness in acquiring "even a rudimentary knowledge" of Italian "remained steadily against her, keeping her, apart from any other consideration, a very isolated person in her own establishment." She "persistently refused to identify herself with her husband's interests," clinging "with stupid pathos" even to the French manner of dress. 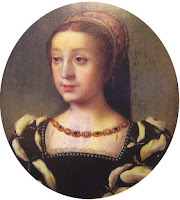 Thus isolated, Renée turned to other pursuits, and her court at Ferrara became a safe haven for intellectuals like the classical scholar Olympia Morata, the poet Vittoria Colonna, and the French poet Clément Marot, and a refuge for French Huguenots. John Calvin visited Renée's court in 1536, and under his influence she was converted in 1540. In retaliation, Ercole dismissed and imprisoned members of his wife's household staff. Although she had been granted "exemptions" for her religious views by Pope Paul III in 1543, in 1554 she was brought before the Inquisition by Julius II. Ercole separated his wife from her children and imprisoned her. "We kept her shut up for fifteen days, with only people who had no sort of Lutheran tendencies to wait upon her," he wrote, adding, "We also threatened to confiscate all her property." In spite of all the pressures, Renée withstood her examination by the Inquisition, and a formal sentence was passed against her. She was condemned for heresy and again imprisoned by her husband. A week later, she recanted, however, and those whom she had formerly befriended did not rally to her defense in her in this time of need. Calvin's response was shocked: "What shall I say, except that constancy is a very rare virtue among the great of this world?" Olympia Morata said she was not surprised by the recantation, since she had always believed Renée's was a weak mind (une tête legère). Renée lived apart from her husband after her release. In 1559, after her husband's death and estranged from her son Alfonso, she returned to France after thirty years in Ferrara, settling on her estates near Montargis. During the wars of religion that raged after her return, she was besieged by her son-in-law Francis, duke of Guise. When he threatened to destroy the walls of her fortress, Renée replied that "she would herself mount the battlements and see if he dare kill a King's daughter." Renée and Montargis withstood the siege, and in the religious persecution that followed, she offered a haven to French Huguenots "to her own constant peril." Under the circumstances, John Calvin, who seems to have been as "inconstant" as the woman whose inconstancy he had bewailed, resumed his friendship with Renée, and his correspondence to her indicates his recognition at last of her courage. This courage led her to write "imploring letters" to her son in 1569, protesting his persecution of those suspected of following reformed religion and to providing a haven for Huguenots again in the same year. But her son ignored her pleas, and, under threat, she was forced to send away those who had come to her for protection. She reportedly told the king's envoy that "if she had his sword in her hands, he would deserve to die, as a messenger of death." Gisors and Vernon were given to the Duc d'Alençon, Caen and Falaise had been seized by Alfonso [her son] for debts, Chartres and Montargis were to belong to the Duchess of Nemours [her daughter Anna], but Renée was suffered to remain as a pensioner in her own castle. Her son Alfonso was furious and wrote the most bitter letters to his mother, whom he never forgave, for yielding any possible claim to [Brittany]. In 1572 Renée was in Paris for the marriage of Henry of Navarre, who would become Henry IV of France, and Marguerite of Valois. Lodging with her daughter Anna, whose Catholic husband was the duke of Nemours, Renée escaped the bloodbath of the St. Bartholomew massacre. We, Renée of France, Duchess of Chartres, Countess of Gisors, Lady of Montargis, widow and dowager of the late Monseigneur of good memory Ercole II of Ferrara, Daughter of the lady King Louis XII and the late Queen Anne, Duchess of Brétagne. *This entry has been adapted from The Monstrous Regiment of Women: Female Rulers in Early Modern Europe (Palgrave Macmillan). And many thanks to Amy-Eloise for her correction (see below, comments)--her correct identification of an image in an earlier version of this post allowed for my correction here. 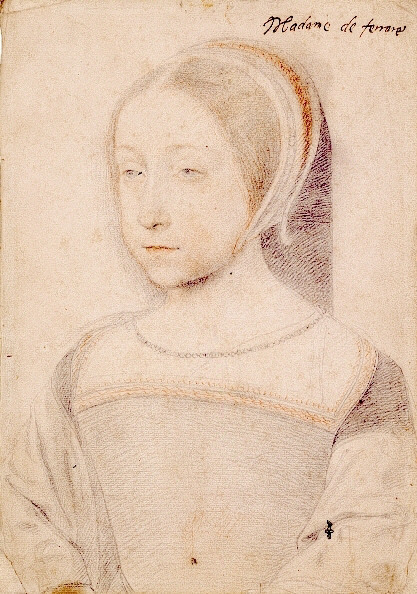 The portrait she identified has been removed, and a second (correct) image of Renée of France has been added.